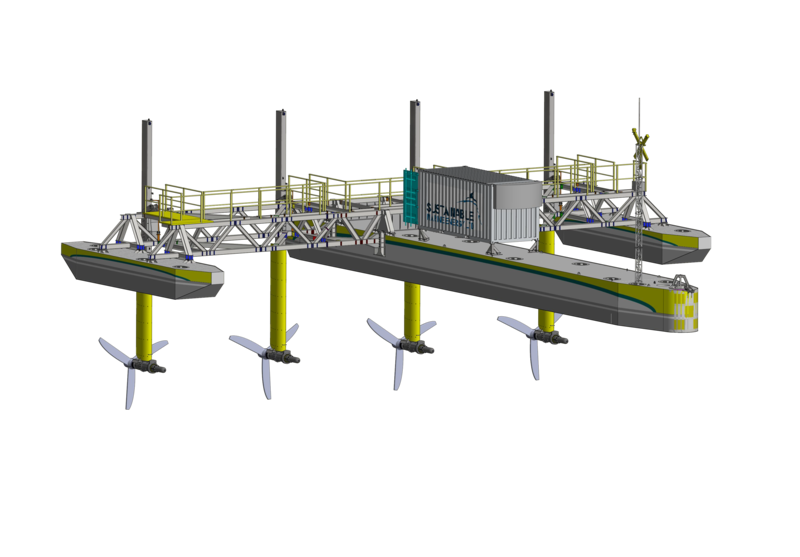 The PLAT-I floating tidal energy platform is designed for more sheltered and slightly more benign sites in terms of wave climate – corresponding to the I in the platform’s name which stands for Inshore. Such sites are in abundance in Southeast Asia, the target market for PLAT-I. The trimaran design for the platform, which hosts four SCHOTTEL HYDRO SIT250 turbines, was designed to provide low resistance and enhanced stability. The 280kW PLAT-I is 32 meters long, with a beam of 27 meters. The platform’s modular design can be broken down for shipping and assembled close to site, the shallow draft configuration also permits launch and tow out with limited port infrastructure. The platform is integrated with mooring turret which enables alignment with flow in any direction, while turbines have been configured for maximum power extraction in shallow water channels. Swing up turbine deployment modules allow maintenance access at the surface. The platform is set for deployment in the Philippines, but first, it will be trialed in Connel Sound in Scotland later this year. It was was manufactured in Peterhead by JBS Group Scotland Ltd with the support from the Scottish Enterprise and Highlands & Islands Enterprise.